• Only 15 minutes by London Underground or Overground from the West End! • Featuring: painting, sculpture, installation, ceramics, animation, photography, graphic arts and book arts. • Part of the popular East London arts festival the E17 Art Trail, located near Inky Cuttleﬁ sh Studios, Artillery and Tokarska Gallery. • Among the 28 artists at Blackhorse Lane Studios are winners of Jerwood Prizes and many other art prizes; graduates of the Royal College of Art and other major art colleges; and sculptors, painters and video artists. 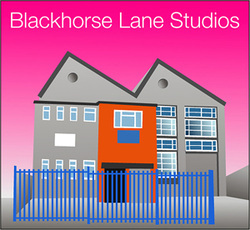 Blackhorse Lane Studios is located in the vibrant art area of Walthamstow in NE London. This new artists’ space managed by the Barbican Arts Group Trust (BAGT) has been here just three years but the 28 artists have a much longer history with their collective achievements in education, exhibitions and prestigious art prizes. The BAGT artists’ diverse practices transverse both contemporary and traditional styles. The studio artists include sculptors using both organic and recycled materials, a painter using highly personal subject matter, beautiful works created from large scale paper cuts that relate to the female form, an artist that uses glass to make interactive works, another artist layers transparent colours to elicit a subconscious reaction, a painter of Rubinesque male ﬁ gures, large scale quirky animal characters created by palette knife, and an installation artist who uses light projections. Two days when artists open their studios to the public the Open Studios is your chance to meet the artists in their work environments, get insights into how and what they create, and even take home a work of art. Engage in one of the most exciting aspects of contemporary art by discussing art with the artists themselves. Stop by and enjoy, be inspired and perhaps challenged at this friendly, relaxed event. It is also a good opportunity to purchase original works at pre-gallery prices! Visitors will have the chance to bid on an artwork by a Blackhorse Lane artist in the Silent Auction. Part of the proceeds from the auction are donated by the artists to Barbican Arts Group Trust’s Public Programme. You can see the artworks in the auction in advance by going to the website: www.artworksproject.com. Bidding starts on-line in September 7th and in person at the Preview Evening on September 9th. Blackhorse Lane Studios building. http://www.barbicanartsgrouptrust.co.uk. This year’s exhibition is selected by distinguished artists Graham Crowley and Kiera Bennett who will be awarding £1,000 and £500 prizes, both with solo shows at ArtWorks Project Space. Graham and Keira will discuss the works in the show and how they were selected at a special event on Saturday 10th September at 2pm. In addition to the Open Studios, Silent Auction and the ArtWorks Open there is more going on: member of ‘Forest Poets’ will be performing poetry readings on Saturday Sep 10th between 1:00pm and 3:30pm and for children there will be an Art Quiz (with prizes donated by Jackson’s Art Supplies) to encourage the younger visitors to ask questions of the artists about their work. The artists include Charlotte Hodes winner of the Jerwood Drawing Prize, Sandie Sutton who has permanently placed commissioned sculptures in London Parks, Mike Thorn winner of the Pride in the House exhibition, Helen Maurer winner of the Jerwood Prize for Glass. Other achievements of the artists include a number that have been short listed for the Jerwood Drawing and Sculpture Prizes and the Max Mara Prize, commissions for British Telecom, British airways, and the Bank of England, visiting artist in Santiniketan in Bengal, India, a winner of a Millennium Award and many more too numerous to list. Gisli Bergmann, Helen Maurer, Matilda Bevan.